I purchased this beautiful upholstered bed 3 years ago. The color is charcoal as stated, the quality is outstanding. My family and a couple of friends have seen it and I have received the best complements. It is beautiful! This David collection by Jennifer Taylor Home will bring a classy look to any bedroom. This wingback headboard bed is accented with a hand applied nail head trim along the wings' silhouette and hand tufts throughout the headboard and footboard. 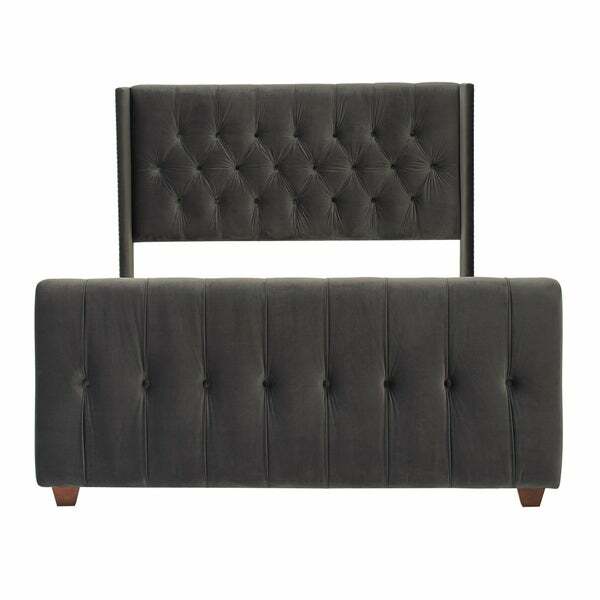 With its plush tufted material on the headboard as well as the footboard, it's an easy way to bring together your room decor. *The digital images we display have the most accurate color possible. However, due to differences in computer monitors, we cannot be responsible for variations in color between the actual product and your screen. Dimensions 67.0 In. X 88.0 In. X 54.0 In. LOVE this bed! Very easy to assemble- took about 20 minutes with a partner. Fabric is plush and didn't have any odor when package was opened. Love the wingback headboard and tufting. Can't beat it for the price!! Finally the bed of my dreams! This bed is exactly what i expected based on the picture! It compliments my master bedroom perfectly! The texture and color are very LUX! The bed arrived in 2 boxes and was easy to put together. Me and a friend had it assembled in about an hour. All the parts were there and the directions were easy to follow and It’s super sturdy! Gorgeous Bed!...I am extremely pleased with this purchase. We received this bed well packaged, and put it together in a few hours. The frame appears to be strong and sturdy. I recommend this bed to anyone who want a beautiful opulent look for a fraction of the price. This bed looks nice and was a great value. We have had it for a year. The quality of the fabric is not as nice as I had hoped. The tufting areas do show dust and are difficult to vacuum. Beautiful bed. Super sturdy and does not move at all when moving around. Was concerned about the dog hair sticking to the velvet, but it doesn’t seem to be an issue. "Can you tell me if this King bed is compatible with your adjusted bed frame? I also want to know if a box spring will still be required if I have an adjustable frame"
Yes, this can accommodate an adjustable base. Just do not install the slats that support the box spring and mattress so you can use the frame with an adjustable base. No box spring would be necessary with an adjustable base. "what does the back of the bed look like? is it the same fabric?" Yes, the back has a black fabric covering it. "Are the rails included? " Yes, the rails are included. "What are the dimensions of the queen size?" 67"W x 88"L x 54"H for Queen bed set . This bedframe does require a boxspring. For the color and fabric. "Do I need a board underneath or bottom mattress? " This bed set come with slats underneath to support mattress and box spring.